Diego Costa has not been included after picking up another hamstring injury. 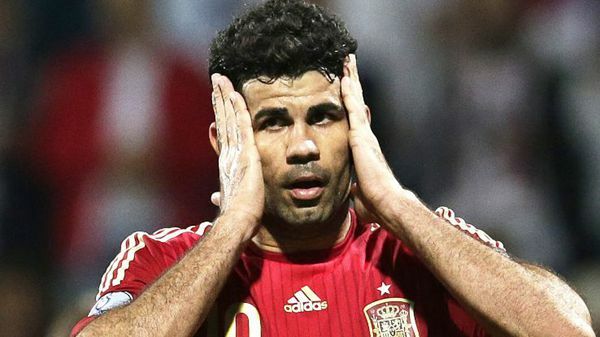 Premier League-based trio Diego Costa, Juan Mata and Santi Cazorla were among a list of high-profile absentees for defending champion Spain when coach Vicente Del Bosque named his provisional 25-man squad for Euro 2016. Atletico Madrid striker Fernando Torres also failed to make the cut yesterday despite showing his improved form towards the end of the season, as did Valencia forward Paco Alcacer, the top scorer in Spain's qualifying campaign. "We didn't want to have an overload of players who were in an uncertain situation, we preferred not to bring them," Del Bosque said yesterday. Costa hurt his hamstring in Chelsea's penultimate game of the season against Liverpool. First-time call-ups went to Atletico Madrid midfielder Saul Niguez, who scored a breathtaking individual goal in the UEFA Champions League semifinal first leg against Bayern Munich, and Real Madrid winger Lucas Vazquez. Athletic Bilbao striker Aritz Aduriz, who scored 36 goals this season, was named in a squad for a major tournament for the first time, aged 35. Spain starts the defense of its title against Czech Republic on June 13. Del Bosque also named an 11-man reserve list including Arsenal defender Hector Bellerin, who will join up with the squad to compensate for the absence of 17 players still involved in domestic and Euro competitions with their clubs. Meanwhile, Germany coach Joachim Loew has named four talented youngsters, including three uncapped players, in his preliminary 27-man squad. Versatile midfielder Joshua Kimmich, striker Leroy Sane, Julian Weigl — another midfielder — and wide man Julian Brandt were all included when Loew announced his provisional Euro squad yesterday. Sane, 20, is the only one of the quartet to have earned a senior cap, making his national debut as a substitute against France in November 2015. He scored eight times this season and his explosive speed and skills were rare bright spots in Schalke's otherwise disappointing season. Kimmich, 21, who played at both center back and as a holding midfielder for champion Bayern, earned praise from his coach, Pep Guardiola, during his first season at the club. Borussia Dortmund's Weigl had a superb Bundesliga debut season as his club finished second, while fellow 20-year-old Brandt's nine goals earned Bayer Leverkusen third spot. Injured captain Bastian Schweinsteiger, who is racing to be fit for the tournament in France, was also included in Loew's provisional list. Germany faces Ukraine, Poland and Northern Ireland in Group C of the competition, starting on June 10.